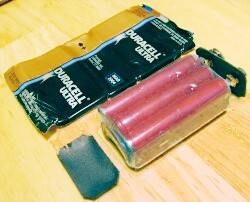 Have you ever wondered what is inside the familiar 9-volt battery? I have read about there being AAAA cells (that's right, A-A-A-A), but wanted to see for myself. So, I used a small screwdriver and a pair of pliers to remove the outer metal case. This first picture shows the six AAAA cells bundled together and contained with heat-shrink tubing. so 6 x 1.5 = 9.0 volts. For a size comparison, a standard triple-A (AAA) cell is shown next to one of the AAAA cells. Since the cells are connected in series, than means the overall current rating for the battery assembly is the same for each AAAA cell. So, each AAAA cell is rated at 2.1 amps with an energy capacity of 550 mAh (milliamp-hours). Prior to the advent of miniature wireless devices like Bluetooth headsets, wireless mice, stereo remote controls, etc., almost nobody had ever even seen a AAAA cell. Still, probably the vast majority of people do not know that the familiar, ubiquitous 9V battery is composed of six of them. 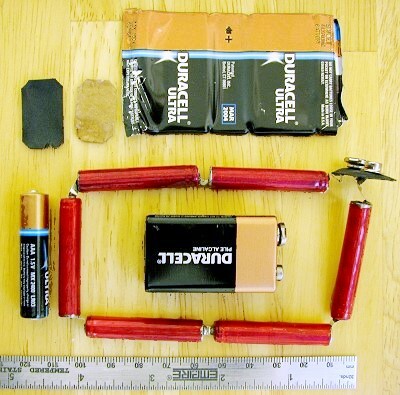 - How Many AA Batteries Would to Take to Power a Human?